Liam Stewart opens up about playing for the Chiefs and having super-famous parents. His parents might be Rod Stewart and Rachel Hunter, but Liam Stewart is making a name for himself on the ice. Liam Stewart grew up surrounded by fame and fortune, the son of rock star Rod Stewart and supermodel Rachel Hunter. 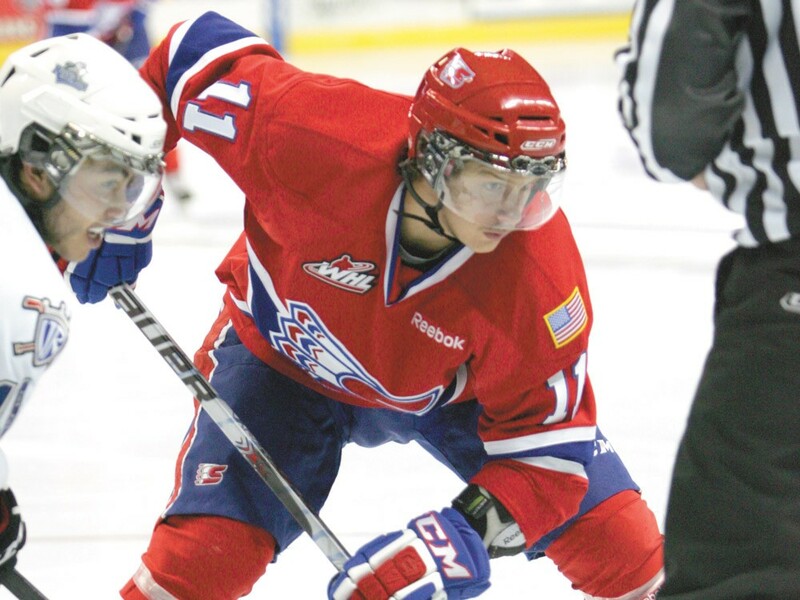 The odds of him growing up in ritzy, sun-kissed Hermosa Beach, Calif., and leaving home at 17 to play hockey for the Spokane Chiefs are almost as long as the odds on him being so … normal. “He’s a good teammate, a good friend,” says Chiefs coach Don Nachbaur. One gets the impression that Stewart would be a welcome member of the Chiefs if he was only a marginal talent, but he’s so much more than that. Blessed with you’ve-got-to-be-kidding-me speed, Stewart sees regular time on the penaltykilling unit and scored 14 goals and 26 points in 66 regular-season games this year. He led Western Hockey League rookies with four short-handed goals, including two against Victoria on Feb. 29 to cap his eight-goal outburst in the last 13 games of February. Stewart, a lanky youngster who seems to be forever wearing a knit cap and an impish grin off the ice, says he fell in love with hockey after watching a New York Rangers game as a toddler when his famous father was performing in the city. He graduated from high school a year early last summer so he could focus more on hockey. Hunter, by all accounts a normal “hockey mom” aside from her appearance, rents an apartment near the Arena and makes frequent trips to Spokane to watch Liam. Father Rod still performs regularly all over the world, and he recently saw Liam play as a Chief for the first time. “He loved it. It was a game against Tri-City. He didn’t expect 10,000 people. He expected like last year in Midget (16-and-under), like 50 people,” says Stewart. Born in London like his father, Stewart and his older sister were raised by Hunter in the coastal Los Angeles town of Hermosa Beach after their parents split. Stewart, who says he’s grateful for the support that both his parents provide him, has dual citizenship in Great Britain and his mother’s native New Zealand. Stewart was invited to play for Great Britain in the upcoming World Under-18 Class B Championships in the Netherlands, but he expects to miss the tournament due to the WHL playoffs. Stewart hopes to be drafted by a National Hockey League team this summer in his first year of draft eligibility. He’ll need more grooming in Spokane regardless. He’s listed at 6 feet 1 inch tall and 180 pounds, but Stewart — accustomed to playing about half as many games per season — says he’s down to 172. Thankfully, Stewart arrived in Spokane plenty mature off the ice. If Stewart winds up starring in the NHL, he could wind up being more famous than his parents. Or, maybe not. “I highly doubt that,” he says with a huge grin. The Spokane Chiefs open the Western Hockey League playoffs with games Friday and Saturday, March 23-24 at Vancouver. Games 3 and 4 of the best-of-7 series are set for Tuesday and Wednesday, March 27-28 at the Spokane Arena. Tickets $10-20, are available at the Chiefs ticket office at the Arena, 328-0450 and at TicketsWest branches (800-325-SEAT).